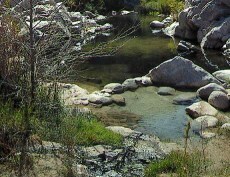 KING CITY, CA…The Monterey Ranger District of the Los Padres National Forest is partnering with Save Our Shores to coordinate a group cleanup on the Arroyo Seco River on Saturday, September 25, 2010, from 9 AM to noon. The event is open to volunteers of all ages, and those who are interested in participating should meet at the Day Use Parking Lot of the Arroyo Seco Recreation Area at 8:30 am. Volunteers are encouraged to wear long pants and sleeves, sturdy boots, and work gloves. Drinking water and trash bags will be provided on site. For more information, please contact the Monterey Ranger District at (831) 385-5434.